Arallu was created as the solo project of Moti "Butchered" Daniel, a bass guitarist who has performed live with Melechesh. Arallu performs black metal with oriental influences and touches of thrash metal. The debut album, 'The War on the Wailing Wall', arrived in 1999 and featured "a drum machine programmed to ludicrous speed". In 2002, Arallu released their second album 'Satanic War in Jerusalem'. The album featured a cover version of Slayer's "Evil Has No Boundaries". Daniel expanded the band's line-up after the release of this album and a DVD 'Visual Chaos Invasion' was released in the following year. The year 2005 saw the release of Arallu's third album 'The Demon From The Ancient World' with guest performers from various Israeli acts including Zeev Tananboim of Salem. Daniel returned the favor with a guest performance on Salem's chart-topping Strings Attached album. In September 2007, Arallu opened for Mayhem's concert in Tel Aviv. Their fourth album 'Desert Battles - Descending to the Sands' was released in 2009. The footage from the performance was filmed and scheduled for release in 2010 as the band's second DVD 'The Ultimate War'. 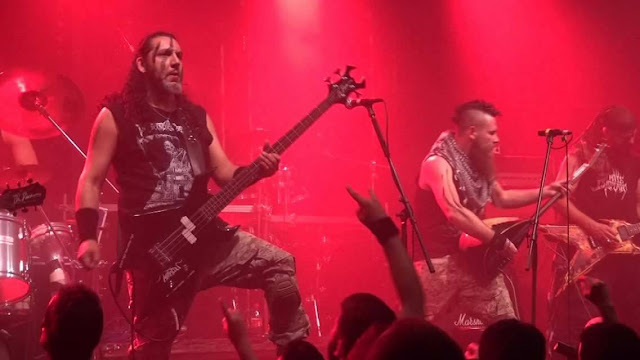 On August, 2009, the band was the opening act for Behemoth on their show at the Barby club in Tel Aviv, along with Arafel. In September 2011, the band went on their first European tour, playing a few dates in Germany, Switzerland and Austria. In October 2012, the band went on their second European tour, playing a few dates in Austria, Switzerland and Hungary. Other two albums have seen the light meanwhile: in 2015 'Geniewar' and the last 'Six' (in the middle the third DVD release, 'Middle Eastern Battlefield'), main topic of this chat with the main member of the band, after their concert of last January with Satyricon . It's a pleasure for me to interview a band like yours, with such long history. You are in the metal scene since 1998, which is your personal balance after 20 years? B:Hello from Jerusalem and thank you for this interview. I'm Butchered Arallu, main member. Arallu was founded in Jerusalem in the middle of the conflict between the religions around the old city of Jerusalem in the 90s'. When you live and the terror is surrounding you and you grow up in this endless conflict, if you want or not, it inspires you whatever you do. I remember the bus exploding close to me when I was in my way to school. We saw every day the hatred comes through the TV news. I was 16 years old and the extreme black metal concept around Europe came to my life mixed with the bloodshed around Jerusalem, is what brought Arallu to life. Last September 2017, 'Six' saw the light as the 6th album by Arallu: after almost six months, could you let me know the feedbacks you got from the magazines and websites, are you satisfied with them? B: 'Six' got really great reviews and feedbacks from all around the world. We have new fans from many places we didn't even know had a metal scene, and all thanks to our label "Transcending Obscurity Rec" and Kunal Choksi who did a great work with this album. Could you let me know how the new album was born? Where it was recorded? Is there any anecdote behind its recording? B: 'Six', like the previous albums of the band, is talking about the situation around the Middle East as it crawls to Europe and the US, and some personal issues we deal with our everyday life. In each album by the band, we used different Middle Eastern instruments except the drabukka that we used in all the albums because it's the basic instrument of Arallu music. I believe that in the next album we will be looking for other instruments. We don’t want our listeners to feel like every album of Arallu is the same. We're trying our best not to repeat ourselves, so every album we're using different Middle Eastern instruments. The artists who made our cover art for this album is the same guy who did the cover of our last DVD dated 2016, 'Middle Eastern Battlefield'. His name is Bjoren Grasses from Germany and he is a big fan of Arallu from 2002. He did a great job with these 2 paintings for us. He sketches it by hands. He's a real talent and if some bands are looking for covers they have to check his works. The layout of this cover was made by our guitar player Gal "Pixel". You can see around the "6" some Hebrew words that refer to the names of Angel, Devil, God and Seraph that represents the dilemma of mankind. You will find these words inside the song "Adonay" which meaning is "GOD". The album was recorded in our studio in Jerusalem and with regards to the sound of the album, we worked with Dory Bar Or. He knew what kind of sound we were looking for. This guy is a real professional and knows how to take Arallu music from the stage into the speakers. We worked hard for this sound. Something like 7-8 versions along three months of hard work, to get the final one of mixing. We don’t like the new sound of the metal bands around the world. We like to make our instruments clear but raw. Evil. War machine. We're trying to let our music sound live even though it is recorded in the studio. And after 6 months, would you change something of the new album or are you happy of the work you did? How the new sound has advanced since the previous album, which are the differences with 'Geniewar'? B: every album has his own sound. Our album are different in the lyrics and the music. The sound of 'Geniewar' or 'The War on the Wailing Wall" is not suitable with the one included in 'Six'. We are really happy with the final results but we never play at the shows exactly like the album. For a few songs we have a live version for our shows. I am very attracted by such Middle Eastern sounds mixed up with black and thrash metal, a common element also with you fellow contrymen Melechesh: where and why the choice to use this sound was born? B: when I started listening to the European black metal bands of the 90's, I really liked the idea of the local folk music inside the raw sound of black metal. I thought to myself "I can't play like that. I can’t write music like that. I can feel the cold and the mountains coming out from the speakers! If I try to sound like that, no one will listen to my music. I can’t make it sound like that. But I will bring a special sound and guitar riffs with special instruments combined with them". Middle Eastern music is my childhood home music. My father was listening to this music since I was a child. The combination between the European and Middle Eastern sounds is not so easy to do and we work hard to combine them and after many years you can see it works together. What about the lyrics of 'Six'? Did any day by day fact of your region influence them? B: of course! The song "Adonay" (God) is about a man from Jerusalem that was killed by a terrorist attack and left behind him a huge world of people who loved him, but actually this song was talking about the last days of my grandfather who really suffered before dying a few months ago. He was my model and I really admired him. The song "Possessed by Sleep" is about the murder of a little girl named Hillel Yaffe Ariel, who was killed in her bed by a terrorist while she was sleeping. When you live around Jerusalem and you have 3 children, all you're thinking about is how to keep them safe in this horrible world. From the other aspect we have the song "Soulless Soldier" which is about a soldier in the army service who fights the war around Israel and when he killed a terrorist who tried to kill some Israeli soldiers, the government put him to jail for that. It's absurd. "Oiled Machine of Hate" is about the neverending bloodshed in Jerusalem. When I’m writing my music and my lyrics, I'm not looking for some victories. I mean, I'm looking for something fresh, something that no one touched before. Because our music is a mix of extreme black metal with Arabian / Middle Eastern music, it's very hard to understand it at the first listening. Usually, people who like extreme black metal don't like the Middle Eastern parts and vice versa. When we wrote this album, we knew it could be risky and we knew it from the debut album in 1999, but Arallu always looks to bring something different to the global metal scene and we're doing it in small steps. The atmosphere of this album is similar to the old albums. Our lyrics are straight in your face, against the religions and what they represent and of course the people behind them. Our last albums 'Geniewar' and 'Satanic War in Jerusalem' talk about all these things. Since the wars of the ancient times, kings tried to rule Jerusalem. With that, 'Six' is talking about the wars of today, where ISIS is trying to destroy and kill anyone who doesn’t agree with their religious views. Like in the song "Only One Truth". Arallu concept is the mirror of the human race, hypocrisy of the governments all around the world including Israel, the unwillingness and the fear to fight against the extreme religion leaders. We live in the Middle East as you know. The situation is not easy here in Jerusalem and in general, in Israel. We live in days of war religions, and religions hatred that inspired our music and lyrics. How is the "temperature" in Israel considering the tensions with your neighbours, Syria, Lebanon and Palestine, not least Iran? B: I think it's about time but you have to understand that Arallu is NOT political band. Arallu is a radical band in the music and the lyrics. We do not hate anyone or anybody because of their skin color or their religion. Our lyrics are clear! We rise against what is offensive and hurting us. Us as human beings, us as individuals. The people in Israel don’t know what good life means. We are busy with worrying about personal and national security. Arallu is the horn of the situation in the Middle East and specially the horn of the wars all around the years in Jerusalem. We don't look for paper news headlines. We play and live black metal from the 90s'. I saw so many death and blood along my life, so I'm really not afraid of Islamic groups because of my music. It’s more than a decade that Arallu screams about the global terror. 'Satanic War in Jerusalem', our second album from 2002, was talking about the situation in Jerusalem that spreads to the world. I wrote this album in 2001 when the Islamic terror attacked everywhere in Israel and especially in Jerusalem. Unfortunately, 'Satanic War in Jerusalem' became a self-fulfilling prophecy and today we all know it. 'The War on the Wailing Wall', our debut album from 1999, was a mix between our day life and extreme black metal against religions. Would you tell us something about the video of the opening track "Adonay" you did for the promotion of 'Six'? Is there any curiosity about it? B: most of "Adonay" video is related to my grandfather's funeral. It was really hard to shoot it in real time, but I knew I have to do it to keep this memory for life. The text of this song is really powerful and the man behind the subject of the text as well. Do you have any tour planned? Could you tell us if we will see Arallu on stage in Italy in this 2018? B: we have just started to work for our new album, we finished already 3 full songs. It will be great and honor for us to come play in your great country. 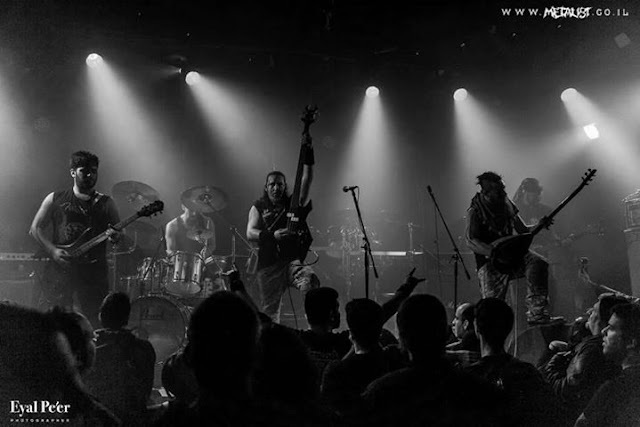 Let's talk about the metal scene in Israel: are there interesting bands in the underground you would suggest us? Is there a new potential band that could replace Arallu? But the problem is not that. The problem is all these bands try to sound like the European and American bands. 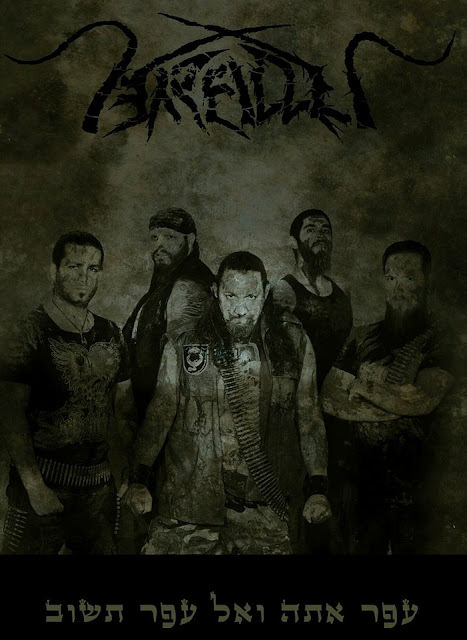 The global metal scene is full with such kind of bands. Except Orphaned Land, no other bands here play some unique and interesting sounds. And now my recurrent last question: during my face-to-face interviews in my radio show, I am used to ask for the desert island list: three books, three records and three films you cannot live without? B: Here you are: Pulp Fiction, Clockwork Orange and The Fifth Element with regards to the film. Slayer 'Show no Mercy', Bathory 'Under the Sign of the Black Mark' and Venom 'Black Metal' my favourite albums. 'IT' by Stefan King, 'Da Vinci Code' and 'Interview with a Vempire' my books.